GRAND PRAIRIE—IKEA’s newest location has been in the works since Fall 2000. Recently, developers put on some of the finishing touches; making a shopper’s dream a soon to be reality. Earlier this week folks gathered to watch the installation of the IKEA signage. The Grand Prairie location will be at State Highway 161 and Mayfield Road, north of Interstate 20. The steel framing on the construction has finally progressed enough that it was time to hang the iconic blue panels. Cranes placed the yellow ‘IKEA’ letters onto the blue exterior panels of the store. Installing the blue panels is a construction milestone that keeps the store on track for its Fall opening. Eager locals watched as the letters were hung to form the words ‘IKEA’ on the north side of the building. “With IKEA Grand Prairie taking shape and the blue paneling now going up, we continue to be on track for a grand opening this Fall,” said Lars Petersson, IKEA U.S. president. The 290,000-square-foot IKEA Grand Prairie sits on 30 acres. The location boasts 1,100 parking spaces for customer convenience. The other two Texas stores in Frisco and Houston are two levels. 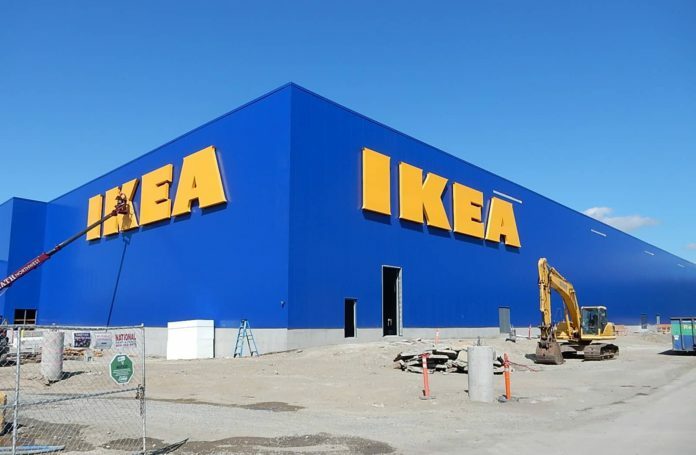 The Grand Prairie will be the second DFW-area IKEA store. As for the economic impact in the area, IKEA Grand Prairie will provide annual sales and property tax revenue for local governments and schools. As well as 500 jobs expected during the construction phase. And 300 coworkers will join the IKEA family when the store opens, according to Roth. Opportunities will be available beginning this summer for candidates interested in working with IKEA in areas of home furnishings sales, interior decoration, customer service, safety and security, cashiers, maintenance, goods flow, receiving, warehouse and stock replenishment. Also, setting itself apart, IKEA Grand Prairie will offer nearly 50 food service opportunities in its Restaurant, Swedish Food Market, Exit Bistro and coworker cafeteria. “We know there are many customers in the area who are excited for us to open. Including those who are driving to Frisco to shop. As well those who have yet to experience the unique IKEA shopping concept,” said Petersson. The Grand Prairie IKEA will feature nearly 10,000 exclusively designed items, 50 inspirational room-settings, three model home interiors, a supervised children’s play area, and a 450-seat restaurant serving Swedish specialties such as meatballs with lingonberries, salmon plates, as well as American dishes. Other family-friendly features include a ‘Children’s IKEA’ area, baby care rooms, play areas throughout the store and preferred parking. IKEA will evaluate potential on-site power generation to complement its goal of renewable energy at nearly 90% of its locations.